With all the political and diplomatic excitement on the Korean peninsula – the election and inauguration of South Korea’s first woman president, South Korea’s successful Nara-1 launch, North Korea’s successful Unha-3 launch, North Korea’s third nuclear test, two bizarre “celebrity” junkets to Pyongyang, the annual ROK-U.S. Key Resolve/Foal Eagle exercises, North Korea’s renunciation of the 1953 Armistice – (catch my breath) one wouldn’t be wrong if she thought the subject itself of North Korea’s actions and its future prospects provoked South Koreans to yawn. What does excite South Koreans is fear of American retrenchment and homegrown nukes. South Korean public opinion on North Korea is actually quite ambivalent. Public reaction has been muted because South-North relations have not been an important issue to South Koreans over the past year (Figure 1). Instead, the focus has been on South Korea’s considerable domestic challenges—household debt, wealth disparity, and economic growth have topped the bill. A failed missile launch in April produced only a slight bump in the perceived importance of South-North relations and a successful launch in December produced no bump whatsoever. Following the February 2013 nuclear test there was a 7 percentage point bump from January, but recent history suggests that this will not last. The muted public response to the nuclear test should not be interpreted as the public feeling unthreatened. As Figure 2 shows, Asan’s daily tracking of perceptions on national security capture a negative effect on the positive perception of both current and future national security. However, that affect was short-lived. While the test sparked an 8 percentage point decline in the positive perception of future national security, and a similar decline in current national security perceptions, both rebounded strongly as February came to a close. This suggests that the impact on security perceptions was real, but fleeting, and that the relative importance of South-North relations will fade in the absence of further provocations. As a part of the Asan Annual Survey in 2011 and 2012, respondents were asked about their threat perceptions regarding North Korea’s nuclear weapons. In both years three-quarters of South Koreans stated that they felt threatened. Moreover, when asked if the North would use those weapons in a renewal of the Korean War, 54 percent and 53 percent, respectively, answered in the affirmative. Further, since 2010 the perceived threat of war has grown by nearly 10 percentage points each year. While in 2010 40 percent stated that a renewal of the Korean War was possible, that number rose to 59 percent in 2012. Clearly, there may be a lack of outward reaction, but the perceived threat of North Korea is very real and growing. Despite repeated provocations President Park’s stated North Korea policy is unlikely to shift. Asan annual surveys from 2010-2011 show a clear majority (67%) have supported her directive of trust building with potential engagement in an effort to improve relations with North Korea (Figure 3). 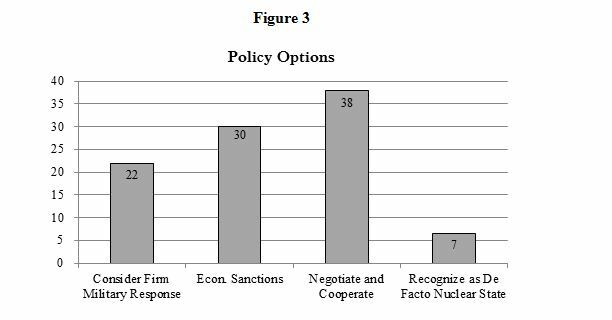 Moreover, when asked about the best policy options (Figure 3), a plurality (38%) preferred that South Korea negotiate and cooperate with North Korea, and 30 percent preferred continued economic sanctions. There was a surprising amount of support (22%) for the consideration of a firm military response, but here the key is to highlight the use of the word “consider”. In a separate question asked this February 13-15, six in ten (59%) opposed a preemptive strike on North Korea’s nuclear test site due to the threat of war. Despite assurances from the United States, the South Korean public is ambivalent on whether or not the United States would employ its nuclear forces in the event of a North Korean nuclear strike on South Korea. In 2012, 48 percent stated that they believed the United States would do so, a 7 percentage point decrease from 2011.However, this ambivalence on the U.S. nuclear umbrella does not extend to the alliance itself—support for the alliance is at an all-time high, with 94 percent support in 2012. Moreover, 61 percent cite the United States as the country that South Korea should cooperate with most closely to solve the North Korea nuclear problem—30% cited China (from the February 13-14, 2013 survey). It’s hard to find a clear guide for policy in this soup. What is worrying is an uptick in support and intensity for a South Korean nuclear weapons program, and a perception among South Koreans, that the United States would not support South Korea with a nuclear response in case of a North Korean attack. But beyond the immediate fear of a military provocation, analysts say deeper anxieties are also at work in the South. One of the biggest is the creeping resurgence of old fears about the reliability of this nation’s longtime protector, the United States. Experts say the talk of South Korea’s acquiring nuclear weapons is an oblique way to voice the concerns of a small but growing number of South Koreans that the United States, either because of budget cuts or a lack of will, may one day no longer act as the South’s ultimate insurance policy. The United States, which still has 28,500 troops based in South Korea, has sought to assure its ally that it remains committed to the region as part of the Obama administration’s strategic “pivot” to Asia. But analysts say the fact that senior leaders like Mr. Chung and a handful of influential newspaper columnists now call for the need for “nuclear deterrence,” or at least hint at it, reflects widespread frustrations over the inability of the United States and other nations to end North Korea’s nuclear weapons program. Until recently the idea was too radical for most mainstream leaders and opinion makers, including both deeply pro-American conservatives and nationalistic yet antinuclear liberals. Advocacy for a nuclear-armed South Korea has been virtually taboo since the early 1970s, when the country’s military dictator, Park Chung-hee, made a serious bid to develop a nuclear weapon, fearing that the United States might pull out of Asia after its defeat in Vietnam. After catching wind of the program, Washington forced Mr. Park, the new president’s father, to stop, persuading him instead to rely on the United States, an agreement that has held ever since. Mr. Chung and others say that if the United States does not allow South Korea to develop its own nuclear arms, it should at least restore the nuclear balance on the Korean Peninsula by reintroducing American atomic weapons, which were removed from bases in the South in 1991 in a post-cold-war effort to reduce tensions. This nuclear hawkishness is markedly different from a Park Geun-hye administration’s rhetorical restraint. It’s also out of step with American public opinion. The 2012 Chicago Council Survey showed that majorities of Americans back interdiction of North Korean ships suspected of carrying nuclear-related material and continued diplomatic efforts to pressure North Korea to stop building its nuclear weapons program. But most Americans oppose the use of military force to curb North Korea’s nuclear efforts. 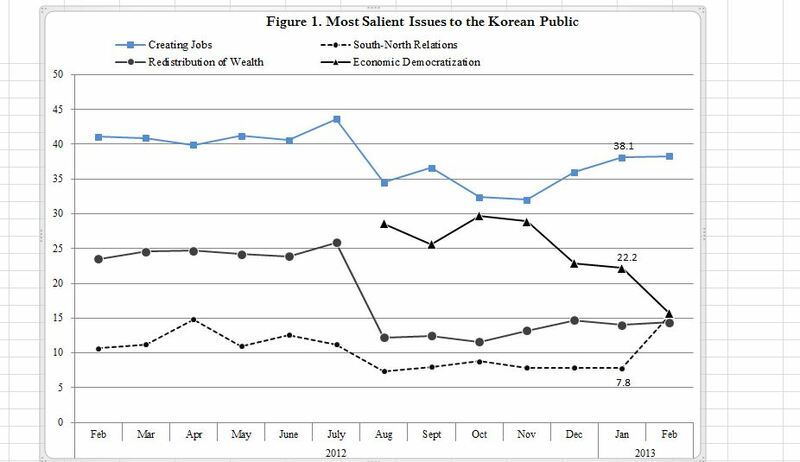 A February 2013 Asan Institute survey found that nonmilitary approaches are similarly favored by a majority in South Korea, though there are some signs of growing discomfort with the nuclear ambitions of its neighbor. Immediately after Pyongyang’s third nuclear test, President Obama spoke to outgoing South Korean President Lee Myung-bak to devise a common plan to take to the UN Security Council. The White House issued a statement that referred to the US “nuclear umbrella,” underscoring US defense commitments to South Korea.1 The American public also supports the US commitment to South Korea. Of all the countries asked about in the 2012 Chicago Council Survey, maintaining long-term US military bases in South Korea received the highest level of support (60%), reflecting a long-term trend of support dating back to 2002. 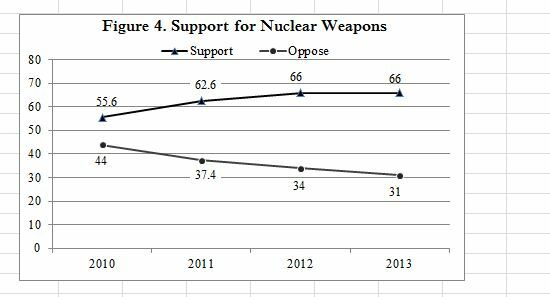 This compares to a near-even split in support for long-term military bases in Japan (51%, vs. 46% opposed). If the threat were to escalate into a North Korean attack on South Korea, the 2012 Chicago Council Survey shows that two in three (64%) Americans would support US troop involvement in a UN-sponsored effort to reverse North Korean aggression, though this support falls to 41 percent if it is assumed to be a unilateral US action. That “41 percent” figure might be the data point the Council on Foreign Relations uses to indicate Americans’ favorable views about South Korea. I’m skeptical that the South Korean public would commit to a nuclear program, and I would like to see data that this isn’t prompted more by moves by the domestic nuclear lobby to deflect attention from public doubts over the use of nuclear energy for domestic uses.